As a child, I can remember opening up a National Geographic Magazine or book and be so captivated by the pictures. Their stunning images made me want to learn more about what I was looking at. They have remained faithful over the years to millions, captivating images so clear and informative that they are so real and get a hold of you emotionally and drag you in. As a home schooling mom, I turn to National Geographic to help educate my children. Studies show that early reading helps kids' mental development and that literacy skills are a good predictor of success both in school and in life. My kids absolutely love to read and I love it! Nat Geo Kids is celebrating National Reading Month this month, so we wanted to introduce you to Discover the Nat Geo Kids Leveled Readers - filled with fun facts and cool nonfiction content on subjects kids love, and the Super Readers program, which inspires (and challenges!) kids to keep reading. As the leader in nonfiction children's publishing, NGK developed this series with experts in literacy education who know that informational reading is critical to children's success in school and later in life. NGK Readers deliver amazing color photos, facts and fun on every page because research shows that these are appealing to kids. They feed a child's natural curiosity about the world an curiosity is a powerful motivation for reading. NGK books are sprinkled with subject-related jokes and puns because research shows that laughing actually helps kids learn. Visual stimulation adds to reading comprehension and enjoyment, so NGK books feature eye-popping illustrations, bold, bright text, and colorful boxes and callouts that encourage the eye to move around the page, taking in every piece of information. Active engagement with a book helps kids to better remember what they've read, otherwise known as "Learning by Doing" and "Experiential Learning." Every page of the book challenges the child to interact with it. Kids can interact even more with the books through the National Geographic Kids Super Readers website, where they can download free posters, sticker sheets, and other prizes and activities as they chart their own reading accomplishments. Though out the Super Readers program, your children can earn prizes as they go. Although my children are in their early teens, they made it into a competition on who could complete their poster first. My daughters favorite prize was the bookmarks and stickers. They also have some pretty cool collectable cards you can earn as well. There is so much to do, it will definitely keep the kids entertained without them feeling like it's school work! 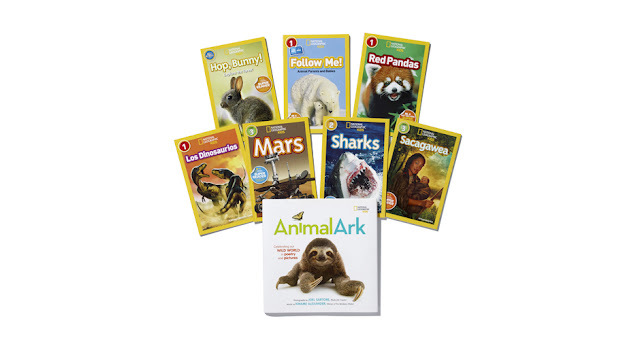 Learn more online Connect with National Geographic Kids online to see their latest products and special offers!